Sea Island basket weaving is a true African American artform whose origins date back to the end of the seventeenth century. This folk tradition was born out of the rise of South Carolinian rice cultivation during the 1680's. 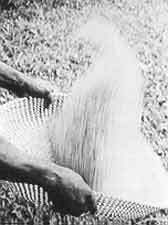 During this agricultural period, American slaves wove fanners, circular baskets approximately two feet in diameter, as tools used in winnowing rice. These slaves' knowledge of rice cultivation was attained from west Africa, a region that has contributed to rice cultivation since the first century A.D. For this reason, there is a great similarity that exists between baskets made in America and those made in west Africa. This African influence on rice growing and the fact that the majority of South Carolinian slaves came from Angola and Senegal have led historians to conclude that the roots from which Sea Island basket weaving has grown are planted in west Africa. Basket Stand in Mt. Pleasant, South Carolina Although basket weaving and its techniques have changed very little over the past few centuries, there are some changes this folk artform has undergone that are worth noting. 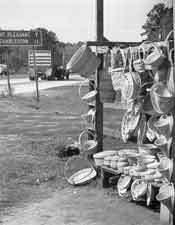 When baskets were first made on the Sea Islands, rush plant and white oak or palmetto were used to make a harder and stiffer product. Today, sea grass is the material basket weavers prefer when making the softer basket that currently comprises the majority of this folk culture. One other way basket weaving has changed is in the amount of creativity that is put into the final product. 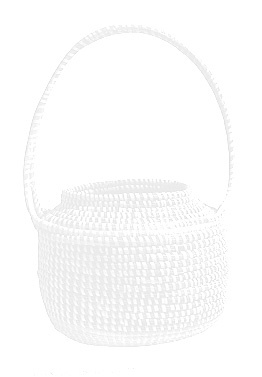 Baskets made in west Africa and during American slavery were very simple in form, while sea grass baskets of today are more decorative in style. In spite of these changes, basket weavers throughout the Sea Islands continue to carry on this folk tradition.